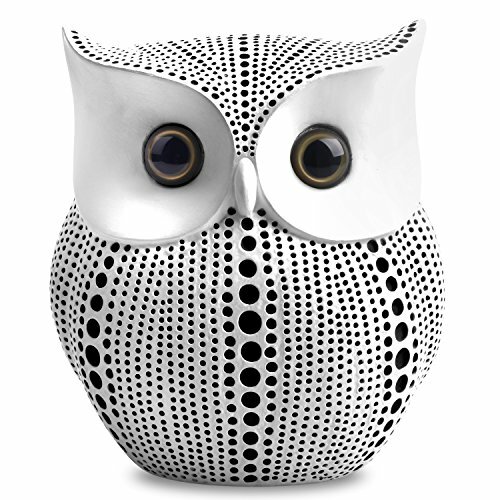 Pretty chubby crafted owl statue with dots pattern, blends well with most home decor. Just place it on the place you like, such as bookshelf, TV cabinet, nightstands, table. Small chic owl figurine is approximately 4.5 inch tall. Sophisticated Owl Ornament, ideal for home decor, room decor, kitchen decor, bathroom decor, bedroom decor, office decor, living room decor, western decor, house decor. Crafted Owl Statue Figurine is a nice gift for your best friend or family, animal lovers, birds lovers, owl lovers. Unique owl bithday gifts for grandma grandpa men women, christmas gift, valentines day gifts for her. Mothers day gifts, teacher gifts, friendship gifts.